Interview: Brent Fitz from The Conspirators! 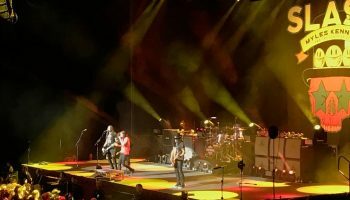 – Spotlight Report "The Best Entertainment Website in Oz"
Interview: Brent Fitz from The Conspirators! Brent Fitz is a talented drummer, who has worked and performed with some of the biggest rock musicians in the world; Alice Cooper, Gene Simmons and most recently has just released a third album with Slash, Myles Kennedy and The Conspirators. Thanks to Janine from Dallas Does PR we got the chance to have a chat to Brent ahead of the tour. SR: How excited are you to be coming down!? Oh, gosh, I love Australia I’ve been there many times now on tour. We’ve played a lot of cool different events like we played the launch of the MTV classic channel, I think that was 2010 with Slash. I remember I was so excited because I love INXS, actually I love all Australian bands, and I got to hang with a couple of the INXS dudes- that was super rad and we’re good friends with Andrew Stockdale from Wolfmother and he played with us, he’s a good friend. I love that. I love, come on Rose Tattoo, we did some stuff with Angry Anderson and I love Cold Chisel! Jimmy Barnes is the most badass singer!! If you look at that list of people- it’s some of the best most original sounding singers like of course we can mention any of the several singers that have been in AC/DC but like oh my god! There is so many!! Some of those bands aren’t necessarily like big bands like AC/DC and INXS but no so much like Rose Tattoo, and some of the stuff that Jimmy Barnes has done but I grew up in Canada and we just seemed to know a lot of those bands; Men at Work were massive come on [laughs] love men at work. I like Split Endz but sometimes when you say New Zealand band, don’t you guys like compete, like Split Endz are a New Zealand band but I love them anyway. SR: Your new album ‘Living the Dream’. Even though it’s meant to be more of a sarcastic comment to the world we live in but even though it’s cliché… you really are living the dream! 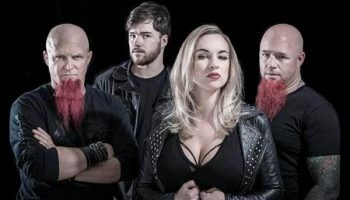 You’ve worked with so many artists like Alice Cooper, Gene Simmons, Vince Neil and now going on the road with Slash, already with a massive back catalogue with him and Myles Kennedy. Do you have to still pinch yourself? Well… yeah, it’s funny because I don’t feel it, even though I should I guess the careful “what you wish for” has come to life. So I grew up in a small city in Canada and all I wanted to dream of doing was to play music and to make it a career and play in front of people. When you’re young you never understand “well how does that work?” you idolise bands. I grew up loving Kiss and Van Halen, Led Zeppelin and one day when you can try to make your own music and your own band then fast forward to 2018 and I guess I get to reflect now. Man I have worked with a lot of my heroes- all those people that I looked up to and it is living the dream. To play music for a living, making a living playing music. It’s one thing to have a love for an instrument and play but to actually find a way to make my parents proud of well… they gave me piano lessons as a kid but I don’t think their intention was “oh we’re going to make Brent a musician out of this” [laughs] no, it’s, that’s how it starts. To look back and say “living the dream’ of something that I dreamed of since I was a kid and to call it a dream. It is reality but the dream is that I can keep doing it. And I guess do some of the best stuff I’ve done, currently. Some of the best things I’ve ever done have happened today, yesterday, not 20 years ago. I’m not living in the past like it’s such a privilege to be out on the road and be here with Slash, and we have a new record and we’re just having a great time. I’m doing the best thing I’ve ever done, today. 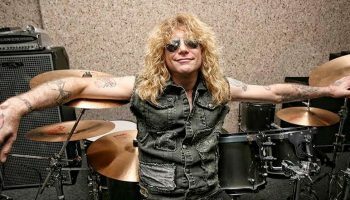 SR: It’s been four years since you released your last album, this time around you decided to keep the same producer but you moved to Slash’s recording studio. Do you think it had an effect on the music making process in a way? Well we are really tight. Like when we get together to write it’s almost like we live it together. It’s the special spice! We don’t just phone in our parts from where we are, we actually get together to work on a song in the same room and that’s a really great thing. So Slash was able to and I think he’s always wanted to, but have his own studio and we’ve recorded in some of the best studios over the past years in LA but for Slash to have his own place with all his amps and controls and everything. What we did for this record was I put a drum kit at Slash’s studio exactly my drum kit- the same specs I use and it just lives there. Todd has a rig and Frank has a rig and so we can just be there and be creative anytime we want. It made it even easier to work on the songs, it was just hey let’s go and we did it every day for several weeks. We put the time aside, we had all these ideas that we were working on from the last World On Fire tour, let’s finish those, so we got busy and we did and next thing you know, you’ve got a record. SR: What’s your favourite track off the new record? Hmmm, well, I’m going to say The One You Love Is Gone is my favourite band collaborative performance, I really liked the feel that everybody contributed to that song… I don’t want to call it a ballad but I guess it is. It’s a more moody song, its fantastic the melody from Myles to Slash’s solo and everything came together and I played as sparsely as I could to compliment the song. Every record I probably have picked a song which I could say well that’s the one that best represents the band. On the last record I would have said Wicked Stone I thought that was where we all really shone. On this record there is a lot of groove oriented up tempo song and they’re all great and they’re all cool, but I think The One You Love, just for me, it leaves me the most satisfied finished. I didn’t know how Myles was going to finish it, when I heard it in the studio- I thought he made it a really special song. SR: I looked on your instagram and I saw a post where someone has referenced you as Snape… are you a Harry Potter fan? My doppelganger, well I have to embrace it. Here’s what happened I had not been familiar with the movies for the longest times and someone would be like “Snape sighting” and tag me in a photo from the show and here’s what’s funny, years ago before I was playing with Alice Cooper and one of the first things Alice ever said to me was “Brent, you know you look just like Alan Rickman”. I remembered Alan from the Die Hard movies, robin hood, but I didn’t know he was Snape, then I realised I do have dark hair and yeah but the sad thing is Snape’s dead, Alan Rickman died and so many people have said I should be the new Snape in the movies. I’m having fun with it, I get want gifts all the time and Snape shirts and dolls. SR: What song do you wish you’d written? It’s one of the most haunting pieces of music. 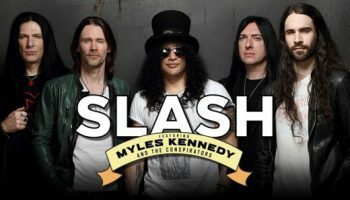 Catch Brent along with Slash, Myles Kennedy and his fellow band mates in The Conspirator’s early 2019! TagsMyles kennedySlashThe Conspiratorsbrent fitzliving the dream toursnakepit studios.